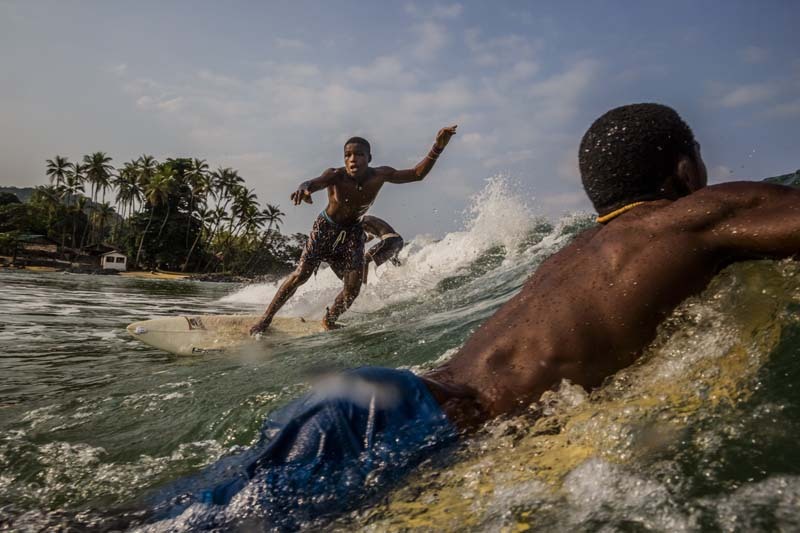 FREETOWN, SIERRA LEONE - NOVEMBER 26: Surfers in the water on November 26, 2014 in Freetown, Sierra Leone. There is at least one place in Sierra Leone, along a quiet, palm-fringed cove, where nobody is talking about viral loads or death rates, treatment centers or protective suits. Instead, the focus is more elemental and more peaceful: on the rhythm of the waves, the pull of the ocean, the sets coming in. Every weekend, despite the fact that this country is in the throes of an Ebola epidemic, or maybe even because of it, a dozen or so die-hard local surfers paddle out into the blue-green swell, floating on their boards like water bugs.